Labor Day weekend has always been the time for sports, running included. Last year Tallahassee's Labor Day weekend racing calendar included the Terry Massa Memorial 5K on Saturday and the Red Cross's Robin Lotane Hurricane 5K on Monday. But this year, the Terry Massa race migrated to September 21 and the Hurricane 5K moved to October. That meant that a first-year race, the Fishnet 5K on Saturday, Aug. 31, was all but alone on Tallahassee's Labor Day weekend running calendar. The Fishnet 5K was a benefit for cervical cancer awareness hosted by the Tallahassee Rollergirls, a roller derby club. Not everyone is an expert on roller derby, but most people at least know that it's a game played on roller skates by strong women with names like "Mimi Massacre" and "Hilda Harpy". In that spirit, let's say that Bryan "Master of Disaster" Koon, Florida's Head of Distaster Management, won the race, running 17:32. The race started on the FSU campus at the Integration Statue near Union Green, heading south on Woodward Avenue. A group of four runners moved out into the lead--Mike Martinez, Anthony Kuchera, Bryan Koon, and Jeff Hoh. The four stayed together though the first mile, but on the second mile Koon made his move, breaking away from Martinez, Hoh, and Kuchera. Hoh and Martinez gave chase, dropping Kuchera, but Koon continued to open a gap. The third mile was more of the same, and Bryan Koon was the first back to the Integration Statue and the finish line, recording a winning time of 17:32. Michael Martinez got away from Jeff Hoh late in the race to take second in 17:58. Hoh was third in 18:22, and Anthony Kuchera fourth in 18:51. Renee Cox didn't share the lead with anyone in the women's competition. At the start Cox went right to the front of the women's field, determined to stay there till the end of the race. Jamie Schindewolf led the pursuit early but was overtaken by Michelle Perry less than a kilometer into the race. Perry was overtaken in turn by Grace Jackson and Urska Dobersek. Indifferent to who was in second, Cox continued to run away from the competition, reaching the finish line in 20:20 with a 500 meter lead. Jackson and Dobersek were left to fight for the runner up spot, a fight where Jackson prevailed, 22:38 to 22:43. Hahira distance runner Colin Prinsloo edged out Tayler Thatcher for the win, 20:04 to 20:08, in the 2013 Valdosta State University Community 5K. Close on their heels was Valdosta's Ricky Smith, third in 20:13. Alice Smoot of Valdosta was the first female finisher in the race as well as the fastest master runner in the field; Smoot placed seventh overall in 21:55. Makenzee Page of Ray City, Georgia was a distant runner-up in the female standings, finishing 13th overall in 23:45. The top male master in the race was Terry Arnold of Lake Wylie, South Carolina, who finished 10th overall in 23:14. The eighth annual race was run on the Valdosta State University campus on Saturday morning, 24 August 2013. In addition to a new course, the VSU Community 5K got a new champion in 2013. Colin Prinsloo's win placed a period on the end of a streak of four straight VSU Community 5K wins, 2009 to 2012, by Chris Rice. The event was conducted by Valdosta State University Campus Recreation, with finish line and timing services provided by A Course/Line, LLC, of Valdosta. 2011 story, "Rice goes for three and Helton for two at VSU Community 5K"
2010 story, "Rice and Turner victorious at VSU Community 5K"
Fishnet 5K and one-mile kids run. 9:00 AM ET. Integration Statue on Woodward Plaza, Florida State University, Tallahassee, Florida. Race flyer. Event web page. Flatlanders Dawg Gone Good Race 5K and one-mile fun run. 7:30 AM ET one mile / 8:00 AM ET 5K. Church Street, behind First Baptist Church, Lakeland, Georgia. 2011 story. Entry form and flyer. Online registration at RunSignUp.com. 2nd annual Alys Beach 5K and one-mile fun run. 8:00 AM CT 5K / 9:30 AM CT one mile. Alys Beach Resort, 9581 County Hwy 30A East, Panama City Beach, Florida. Online registration at active.com. 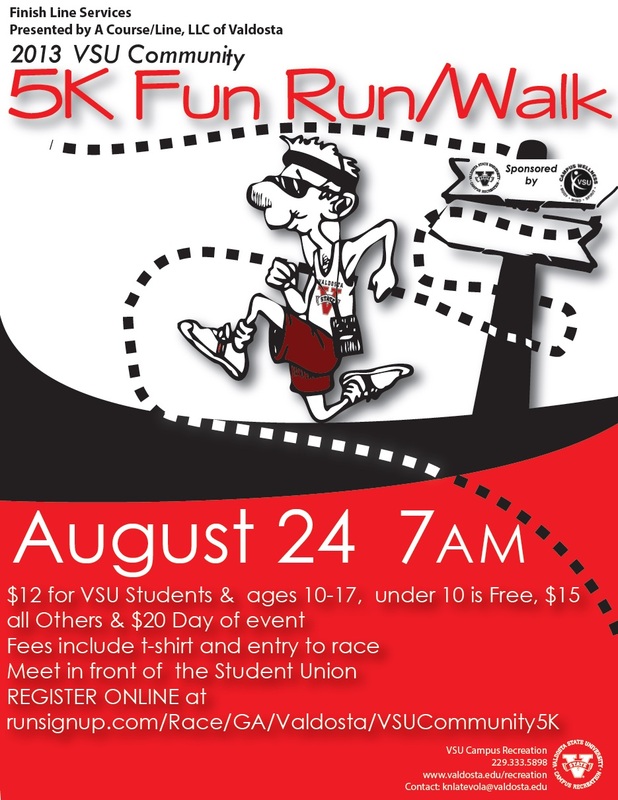 5th annual Valdosta Labor Day 5K and 1500m fun run. 8:00am ET. Azalea Drive and College Street, Valdosta, Georgia 31602. 2011 story. 2010 story. Online registration at RunSignUp.com. A Course/Line, LLC, acourseline@earthlink.net or 229-630-1455. 2nd annual "Will To Heal" 5K. 8:00 AM CT. Campbellton-Graceville Hospital, 5429 College Drive, Graceville, Florida 32440. Terry Edwards 850-529-2880. Come to the River Healing Arts Festival 5K. 8:00 AM ET. Stephen Foster State Park, White Springs, Florida. Online registration at active.com. 386-234-1920. Gulf Winds Track Club's 32nd annual Tallahassee Women's Distance Festival 5K and one-mile fun run. 8:00 AM ET 5K women / 8:05 AM ET 5K men / 9:00 AM ET one mile. Optimist Park, East Indianhead Drive, Tallahassee, Florida. 2012 story. 2011 story. 2010 story. 2009 story. USATF certified course #FL00022DL. Entry form and flyer. Online registration at RaceIt.com. Lisa Unger, unger4122@comcast.net or 850-544-4893. 32nd annual Sickle Cell Foundation of the Big Bend 5K and one-mile fun run. 8:10 AM ET one mile / 8:30 AM ET 5K. Jake Gaither Park, 801 Tanner Drive, Tallahassee, FL 32305. 2011 story. 2010 story. USATF certified course #FL12057EBM. Event web site. jill@sicklecellfoundation.org or 850-222-2355. 4th annual Honor Your Neighbor 5K and one-mile fun run. 7:00 AM ET. McKey Park, Burton Street, Valdosta, Georgia 31602. 2010 story. Event page on Facebook. Entry form and flyer. Online registration at RunSignUp.com. A Course/Line, LLC, acourseline@earthlink.net or 229-630-1455. First Responder 5K and one-mile fun run. 8:00 AM ET. Lee County YMCA, 316 Robert B Lee Drive, Leesburg, Georgia 31763. Entry form and flyer. Gulf Winds Track Club's Salute to Prefontaine 5K Cross-Country Run. 8:30am ET. Silver Lake Recreation Area of the Apalachicola National Forest, Silver Lake Road, Tallahassee, Florida. 2012 story. 2011 story. 2010 story. Event page on Facebook. Entry form and flyer. Jeff Nielsen, dobieman@comcast.net or 850-459-8859. 7th annual Trot with S.W.A.T. 10K and 5K. 8:00 am CT. Poplar Head Park, 126 N. St. Andrews Street, Dothan, Alabama. Brian Goguen, cgoguen@sw.rr.com or 334-794-9029. 5K Run for Love, Peace, and Hope. 8:00 AM CT. Frank Brown Park, 16200 W. Highway 98, Panama City Beach, Florida. Online registration at active.com. Thru The Zoo 5K and Run Your Tail Off one-mile fun run. 7:30 AM ET 5K / 8:30 AM ET one mile. The Parks at Chehaw, 105 Chehaw Park Road, Albany, Georgia. Entry form and flyer. Online registration at ItsYourRace.com. Danielle Sumner, DSumner@chehaw.org or 229-430-5295. Clinch Memorial Hospital 5K and one-mile fun run. 7:30 AM ET 5K / 8:30 AM ET one mile. 1050 Valdosta Hwy, Homerville, Georgia 31634. Entry form and flyer. Online registration at RunSignUp.com. Providence EagleFest 8K, 5K, and one-mile fun run. 8:00 AM CT 8K and 5K / 10:00 AM CT one mile. Providence Christian School, 4847 Murphy Mill Road, Dothan, Alabama 36303. Event web page. Online registration at active.com. 9/11 Heroes 5K. 8:00 AM CT. Grayton Beach State Park, 34 Goldenrod Circle Santa Rosa Beach, Florida. Online registration at EventBrite.com. Four for Ruth's Cottage 4M and Patter for Patti one-mile fun run. 6:00 PM ET one mile / 6:30 PM ET four mile. The Hilton Inn, 200 Boo Drive, Tifton, Georgia. Entry form and flyer. Online registration at active.com. Amy Fraser, amy.fraser@hilton.com or 229-382-8484x503. University Center Club Charity Classic 5K. 9:00 AM ET. University Center Club, Florida State University, University Center Building B, Tallahassee, Florida. Event page on Facebook. Haley Orr, Haley.Orr@ourclub.com or 850-645-5693. 2nd annual Sale City Community Outreach 5K. 8:00 AM ET. City Hall, 122 E. Broad Street Sale City, Georgia 31784. 2012 story. Event page on Facebook. Entry form and flyer. Online registration at RunSignUp.com. Headland Harvest Day 5K and one-mile fun run. 8:00 AM CT 5K / 9:00 AM CT one mile. Grove Street and Main Street, Headland, Alabama. Soaked for Scholarships 5K. 8:00 AM CT. Larry and Rona Dykes Trail, Westgate Park, Dothan, Alabama. rbruce@calvarydothan.com. Run For Life 5K. 8:00 AM ET. The Coliseum, 1302 11th St. SW, Live Oak , Florida. Online registration at active.com. 3rd annual Habitrot at Sandestin Half Marathon and 5K. 7:00 AM CT. Sandestin Golf and Beach Resorts, 9300 Emerald Coast Pkwy-Sandestin Marina, Sandestin, Florida. Event web page. Online registration at active.com. Zombies Run For Your Life 5K. 2:00 PM CT. Ozark Chamber of Commerce, 294 Painter Avenue, Ozark, Alabama. Event web site. Patty Fenn, pfenn@troycable.net or 334-432-3466. Stop The Violence 5K. 4:00 PM ET. Southwood Town Center, Merchants Row Boulevard at Four Oaks Boulevard, Tallahassee, Florida. Event web page. Danielle Gulasa, dgulasa@refugehouse.com or 850-922-6062. Take a Breath for Jess 5K. 4:30 PM ET. Tom Brown Park, 501 Easterwood Drive, Tallahasee, Florida. Event page on Facebook. 10th annual Jim Del Mauro Rosemary Run for Parkinson's Research 5K. 7:30 AM CT. Rosemary Beach East Lawn Green, Rosemary Beach, Florida. Event page on Facebook. Event web site. Online registration at active.com. 5K Trail Run for Cystic Fibrosis. 8:00 AM CT 5K. Westgate Park Tennis Center, 801 Recreation Road, Dothan, Alabama 36303. Dothan First Church of the Nazarene 5K. 8:00 AM CT. First Church of the Nazarene, 1081 Honeysuckle Road, Dothan, Alabama 36305. Joe Kouns 334-718-1155. Blue Mountain Beach Half Marathon and 10K. 7:00 AM CT. 2217 Highway 30A, Blue Mountain Beach, Florida. Event web site. Online registration at active.com. Go Pink! 5K and one-mile fun run. 8:00 AM ET one mile / 8:30 AM ET 5K. Premier Health and Fitness Center, 3521 Maclay Boulevard South, Tallahassee, Florida. Event web site. Event page on Facebook. Entry form and flyer. Cast Iron 5K. 8:00 AM ET. Citizens National Bank Parking Lot, 100 East Stephens Street, Quitman, Georgia 31643. 2011 story. Entry form and flyer. Online registration at RunSignUp.com. 229-242-0676. 6th annual Sandi McCool Champions of Hope 10K and 5K. 8:00 AM CT. Alabama College of Osteopathic Medicine, 445 Health Sciences Blvd., Dothan, Alabama 36303. Event web page. SAMC Foundation, 334-673-4150. 3rd Annual Chomp Cancer 5K. 8:00 AM ET. Fort White Community Center, 17579 SW State Road 47, Fort White, Florida. Event web site. Online registration at active.com. 34th annual Boston Mini-Marathon. 8:00 am ET. Commercial Bank, 124 West Jefferson Street, Boston, GA 31626. 2012 story. 2011 story. 2010 story. 2009 story. Event page on Facebook. Entry form and flyer. Brad Johnson, bradjohnson@bankcb.com or 229-498-8500 (day) / 229-226-4679 (evening). 10th annual St. John Road Race 5K, 1 Mile, and Tot Trot. 8:00 AM ET (5K), 9:00 AM ET (one mile), 9:15 AM ET (Tot Trot). St. John Catholic School, 800 Gornto Road, Valdosta, Georgia 31602-1699. 2012 story. 2011 story. Event web site. Online registration at active.com. 229-244-2556. 2nd annual Dead Man Running 5K. 2:00 PM CT. Wiregrass Museum of Art, 126 Museum Ave, Dothan, Alabama. Event web page. Event page on Facebook. Stephanie Madden, smadden@dothaneagle.com or 334-792-3141. Tricker Trek 5K Zombie Run and One-Mile Ghoul Drool. 8:00 AM CT. Panama City, Florida. Online registration at active.com. Gumby Weckherlin 850-271-5896 or Joe Edgecombe 850-774-0018. Premier Health and Fitness Center’s P3 Challenge 5K and and one mile. 9:00 AM ET one mile / 9:30 AM ET 5K. Premier Health and Fitness Center, 3521 Maclay Boulevard South, Tallahassee, Florida. Entry form and flyer. Online registration at RunSignUp.com. Tonya Smith, 850-431-4822. Bainbridge-Decatur County YMCA Veteran's Day Classic 10K. 9:00 AM ET. Bainbridge College, 2500 E Shotwell St, Bainbridge, Georgia 39819. 2011 story. 2010 story. USATF certifed course #GA98012WC. Gulf Winds Track Club's Miller Landing Madness 8K/5K/3K. 8:00 am ET. Elinor Klapp Phipps Park, Miller Landing Road, Tallahassee, FL 32312. 2013 story. 2012 story. 2011 story. 2010 story. 2009 story. Tom Perkins, 850-894-2019 or Bill Lott, 850-656-1273. 6th annual Valdosta Labor Day 5K and 1500m fun run. 8:00 AM ET. Azalea Drive and College Street, Valdosta, Georgia 31602. 2011 story. 2010 story. A Course/Line, LLC, acourseline@earthlink.net or 229-630-1455. The "Run and See Georgia Grand Prix" has led to some odd distortions in Georgia distance running. For instance, runners get a point bonus for longer races, so race directors attract participants by staging events that are just long enough to earn the bonus. You may have noticed the rash of 10-1/2 kilometer races around the state; that's where they're coming from. Runners hungry for Grand Prix points go to an event and run every race for which points are awarded--the 10K, the 5K, the one-mile kids' run, the 100-meter run in heels, and anything else on the menu. There are other effects as well, but those are the ones that have shaped the Long Run For The Children in Leesburg, Georgia. The main event is a 10.5K (a "double points" distance) but runners can also earn points in the 5K. For the first two years of the Long Run For The Children, runners wanting to double up were asked to first run the 10.5K and then head around the 5K course. Because both races started at the same time, you can imagine how long the finish line had to stay open for the doubling 5K runners. So in 2012 the races were separated, with the 5K starting at 7:00 AM and the 10.5K following at 8:00 AM. This was the situation on Saturday morning, 24 August 2013, when Cleveland, Georgia distance runner Lauren Freeman warmed up with a 20:49 win in the fourth annual Long Run For The Children 5K, then lined up less than 40 minutes later to race the 10.5K. Freeman won that race as well, posting a 49:47 to outdistance the runner-up, master runner Ronnie Kittrell of Gray, Georgia. Kittrell's time for the somewhat odd distance (a smidgen longer than 6-1/2 miles) was 50:35. Freeman's double win wasn't unique. Amber Hodor of Macon, Georgia did the same in the women's competition, turning a winning 22:02 in the 5K and then coming back at the start of the next hour to win the women's division in the 10.5K, placing 3rd overall in 50:41. It was the second year in a row that Hodor had scored a double win at the Long Run For The Children--she had done the same in 2012, setting event records for women at each distance. Cordele, Georgia's Jane Bedore (9th, 55:21) was the second female finisher in the 10.5K. The third woman finisher and first woman master was Leesburg's Anna Wade (16th, 60:48). 80 athletes finished the 5K and 42 finished the 10.5K. 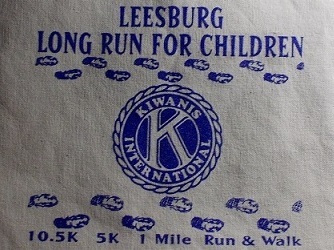 The race was hosted by the Leesburg Kiwanis Club.